The Masterbuilt 20150414R Electric Veranda Grill in bright and shiny red is the perfect addition to any home for outdoor enjoyment. The top-rated grill offers electric operation, which means the grill does not require a gas or charcoal component. The small size of the barbecue grill makes it a great option for small families, couples, even college students. The grill can easily be plugged into an electrical outlet and be used to prepare all your favorite barbecued foods, from hamburgers to chicken or steak. With five temperature settings and optimal controls, you will be well on your way to preparing the best-grilled food possible. The Masterbuilt Electric Veranda Grill is small in size so it will not take up much space within your home. You can easily use this grill on a patio, deck or even a balcony. The possibilities are endless as the grill is so small, it can fit inside an outdoor storage closet or building when not in use. The grill has big cooking capabilities despite its small size. The grill has a 1650-watt cooking element with five temperature settings for quality cooking. The grill plate has 196 square feet of space so you can cook anything you like, including mouth-watering steaks. With an electric grill, a positive is being able to set the temperature for cooking. The settings allow you to cook evenly for meat that is tender and juicy instead of dried out. Upon arrival, the Masterbuilt Electric Veranda Grill is easy to assemble. You can easily begin cooking as assembly usually takes around twenty to thirty minutes. Once you have the grill assembled, you can plug it in and set the temperature. In just a few minutes, the grill is at the required heat and ready for your hamburgers or chicken. The reflector plate of the grill is easily removed so cleaning is a breeze once cooking is completed. To help keep your grill safe from the elements or dust in a storage room, a handy grill cover is included in your purchase. 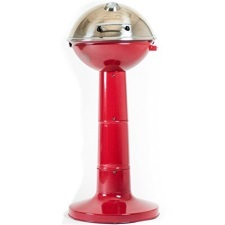 As of the writing of this review, the Masterbuilt Electric Veranda Grill in red had 174 reviews at Amazon with a star rating of 4.1 out of 5 stars. More than 61% of reviewers decided to rate this electric grill at 5-stars. The majority of consumers who have purchased this grill have enjoyed it and find it a wonderful way in which to prepare barbequed food. In the reviews, the positive points include how the grill cooks as well as how easy it was to put together. As far as the negative reviews, only 6% rated the grill a 1 star. Complaints of the grill included consumers stating that the grill cord had a short in it and would not stay powered. Others stated that the thermostat breaks so that it is difficult to see what temperature the grill has reached. Others have complained about the assembly, stating that the components do not fit together properly due to poor hardware. On the plus side, the positive reviews far outweigh the negative by 5:1. Consumers who enjoy the grill has stated that it is awesome to use and is nice in appearance. Comments within 5-star ratings include: “Best Grill!”… “We love this”… “Outstanding product”… “Great buy”… “Get your grill on, love it!” and more. The positive reviews comment on how easy the grill is to use and how the unit does not take up much space and is easy to store. Users also enjoy the bright red color as it makes the grill visually pleasing. Overall, the Masterbuilt Electric Veranda Grill is a top option when it comes to a portable and compact electric grill. The unit is small in size but has the ability to cook the foods you love including hamburgers, hotdogs, chicken, and steak. Prepare food evenly as the grill surface operates via electricity for an even cooking surface. The unit is easily cleaned and stored for later use with the help of the included grill cover. With a top rating and an affordable price, anyone who enjoys grilling will be able to benefit from this electric option. Summer fun is to be had with this grill as well as the option to barbecue in the cooler months with the help of the electrical function. Plug up the grill set the temperature and in just a few minutes you will be ready to put the hamburgers or chicken on!